If you're ever in need of a great chocolate cake or cupcake recipe, you need not look any further. 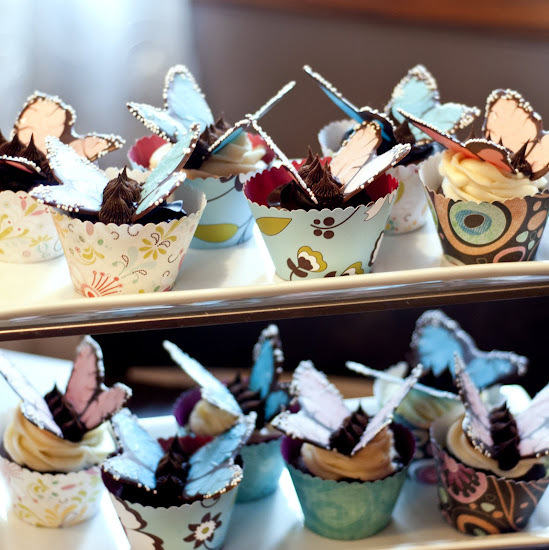 I tried three different recipes for the butterfly cupcakes, and every one of them flopped miserably. The flavor and texture were completely off, and there was no way I could serve any of the cupcakes at the bake sale in good conscience. I was almost on the verge of tears after the third batch turned out disastrous. I didn't realize a good chocolate cupcake was so difficult to make! So I turned to a pro, and I wondered why I hadn't done this in the first place! When in doubt, just head over to Savory Sweet Life. The ever talented and very gracious Alice does not disappoint. When it comes to cake, she knows her stuff (she used to own a wedding cake business). 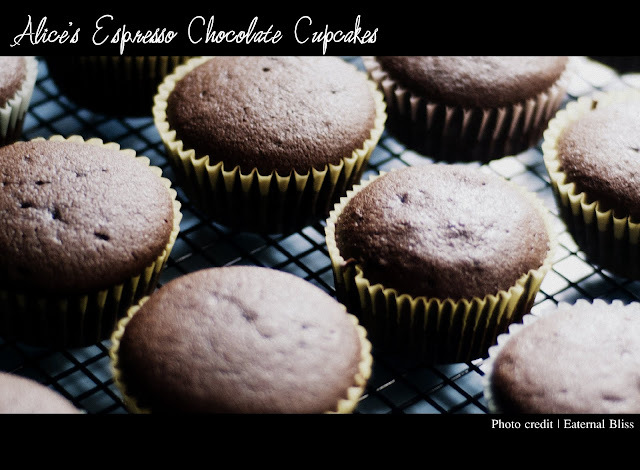 Her chocolate espresso cupcake is to die for. Its flavor is rich and decadent; the texture moist and dense. Need I say more? Just perfect and it saved the butterfly cupcakes. Next time, I will have to try the Frangelico ganache frosting to go with it. 1. Preheat oven to 350 degrees F. Line standard muffin tins with paper liners. In a small bowl, mix cocoa powder and coffee until it looks like a smooth chocolate sauce; set aside to cool. In a large bowl or stand mixer, cream butter and sugars until nice and fluffy. Add vanilla and eggs one at a time, beating well after each one. Slowly add flour, baking soda, baking powder, and salt until batter and mix for 2 minutes. Add chocolate-coffee sauce mixture and mix the cake batter for 3 minutes on medium-high or until the batter is smooth. 2. Fill each muffin cup until 2/3 full. Bake about 25 minutes. Cool in pan for 5 minutes before removing and allow to cool on a wire rack. 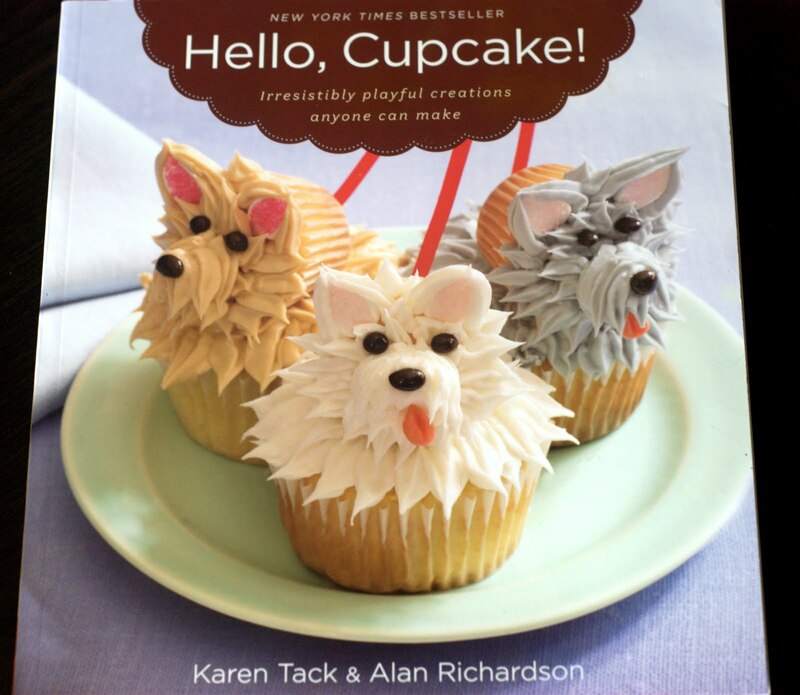 So now it's your turn to make some amazing cupcake creations! I'm giving away two copies of Hello, Cupcake! to readers (domestic U.S. residents only). 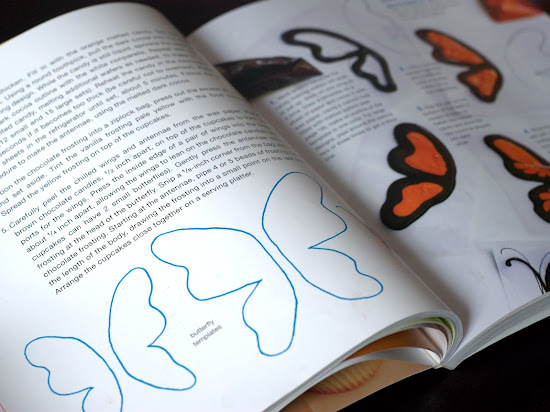 This book is filled with wonderful, playful ideas on how to dress up the average cupcake (like the candy butterflies). The instructions and photos in the book really do make it easy for anyone to make these fun creations. Simply leave a comment telling me what your favorite cupcake flavor is. Like Eaternal Bliss on Facebook and leave another comment letting me know you did so (if you already like, you can add a comment letting me know). Follow Eaternal Bliss publicly via Google Friend Connect (again, if you're already doing this, just let me know). Post about the giveaway on Twitter: "Win a free copy of "Hello, Cupcake!" at http://bit.ly/ia4XOv via @mothersmementos." Leave an additional comment letting me know you tweeted this. Deadline for entry is 11:59pm EST on Monday, April 18, 2011. Two winners will be randomly chosen by a number generator. I'll announce winners and email them directly to let them know they've won. Good luck! And please do try Alice's amazing chocolate cupcake recipe. You won't regret it. my all time favorite flavor is chocolate!! Your cupcakes are simply amazing!! We love that cookbook too, my daughter gave it away as a present and has been on me to get one for her. Wonderful giveaway!! I tweeted about the giveaway!!! Woo Hoo!!! just tweeted about the giveaway as well! Beautiful cupcakes! Wish I　could have one now! I liked Eaternal Bliss on FB! These cupcakes look fabulous! I love adding coffee to chocolate! My favorite flavor of cupcake is peanut butter, slather on some chocolate frosting and I'm in heaven! 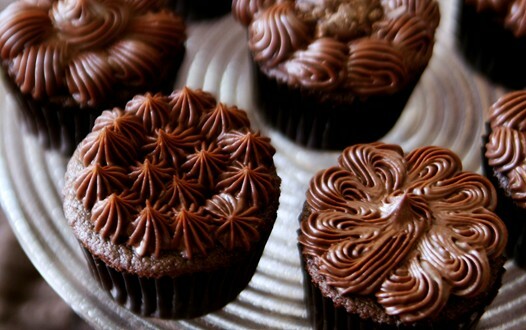 Only a baker with exceptional skills can turn plain chocolate cupcakes to amazing cupcakes because of the unique design for toppings. This look too good!!!! I love the way you made them and photos are stunning!!! Delicious looking cupcakes!! Chcoalte is by far my favorite cupcake flavor! Ohhh, I love them. Coffee is always a great company to enhance the beauty of chocolate. My favorite cupcake is all of them, when moist and irresistible, like yours !!!! I'm going to try this chocolate cupcake. looks delish!!! and also your creme puffs from last time. I am usually avanilla fan. But red velvet always catches my eye too! my fave flavour is... strawberry cheesecake! They sell it at a local cupcake store. yum!